* Versions disponibles: 6507 - Usagé, tous les jeux à disque et tous les jeux de consoles portables viennent avec leur pochette. 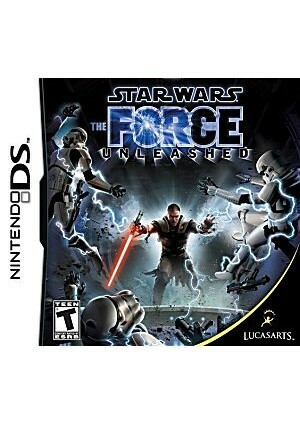 Star Wars: The Force Unleashed is a LucasArts action-adventure video game and part of the The Force Unleashed project. It was initially developed for the PlayStation 2, PlayStation 3, Wii, and Xbox 360 consoles and on the iOS, second-generation N-Gage, Nintendo DS, PlayStation Portable, and Java-equipped mobile phone handhelds. Reviews offered mixed response, praising The Force Unleashed for its compelling story, robust physics, impressive art and soundtrack, but also citing frustrating gameplay. Despite this, the game was a bestseller in the United States and Australia, with over one million copies sold its debut month. As of February 2010, the game has sold over seven million copies, and it is the fastest-selling Star Wars video game. A sequel, Star Wars: The Force Unleashed II, was released in October 2010.